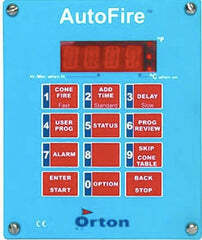 This kiln comes standard with the Orton AutoFire 12-key controller, however you have the option to upgrade to the TAP preprogrammed digital controller. You can do up to a 26" bowl or 18.3 square table top in this kiln. Inside Dimensions 28" x 15"